Have you booked your ticket for the St. Patrick’s event at the Paphos Hotel in Friday 18th March at 7.30pm? It is a fund raiser for the Hospice please see the Fáilte Pafos website for details. (www.failte-pafos.eu) The Irish Ambassador will be present. We were honoured today with a visit from Patriarch Faoud of Jerusalem while in Cyprus for a meeting of Bishops. He celebrated mass at Agia Kyriaki at 9am with Fr. Evencio Herrera Diaz (Vicar General for Cyprus), Fr. Carlos Ferrero & Fr. Jim Kennedy. 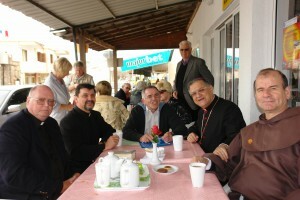 Afterwards he took time to have a cup of coffee at the hospice shop and meet some of the parishioners for a chat. Yesterday afternoon St. Paul’s Parish launched the 400 Countdown Campaign aimed at completing the St. Michael’s Hospice at Mesa Chorio, Paphos. The congregation and our friends and of course many others who have passed by have raised an incredible EUR1.4 million to make the dream of the hospice a reality. Over the years there has been a slow steady progress in gaining the planning permissions and the building of the hospice. Now finally the end is in sight! The 400 Countdown Campaign is aimed at raising EUR400,000 required to complete the final stages of fitting out, equipping and the opening of the Hospice in 2012. 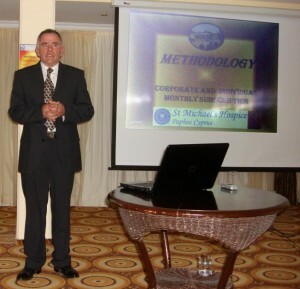 The Campaign was Launched with a presentation given by Cameron McDonald, Fr. 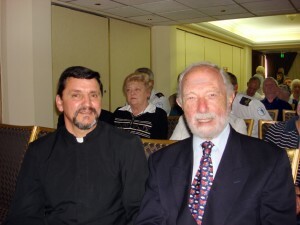 Carlos Ferrero & Fr. Jim Kennedy for invited Dignitaries, Business’s and Parishioners. Cameron explained the campaigns aim to see the hospice opened in 2012 and how it could be achieved and Fr. Jim Helpfully explained how each of us could help contribute to this campaign whether you were a Business or an individual. We were delighted to welcome representativeness from Bishop George of Paphos, The Mayor of Paphos’ Office, the friends Hospice and other business representatives and parishioners. The campaign got off to a wonderful start with donations from the Minister of Health, Bishop George, the Ladies Corona Society, Fitzgerald Estates, Cardinal Vallini’s visit, 2 Austrian tour groups who were in the area (well done Cameron) and numerous individual donations on the day. The total raised to date EUR4,500. Did You Hear The One About A Cardinal & 5 Bishops? In fact it was a Cardinal, 5 Bishops and 130 Parish Priests from Rome! The Cardinal in question was cardinal Vallini the Pro Vicar of Rome who has more than a passing interest in the pilgrimages carried out by Catholics. During his visit accompanying Pope Benedict XVI to Cyprus and Paphos in particular he was so impressed with our parish church Agia Kyriaki and its association with St Paul that he felt is should be a place of Pilgrimage for Catholics. 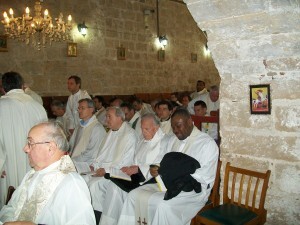 As a result Cardinal Vallini organised the visit to Cyprus and in particular Paphos where the visit culminated in a mass at the Church of St. Paul’s Pillar, Agia Kyriaki. Those present were then given the Hospice Presentation at the church by Cameron McDonald and at the insistence of Cardinal Vallini a collection was made towards the forthcoming 400 Countdown Campaign. There are those that may see the irony of a church full of priests being handed the collection plate, but their generosity was wonderful and the day raised EUR1,700. We were also blessed on this occasion by the attendance of the Orthodox Patriarch of Paphos Bishop George. Thank you to everyone for their generous contributions to the Mission Sunday Collection last Sunday. It raised EUR1,225, thank you.